Giant cell reparative granuloma (GCRG) is a benign bony lesion which commonly affects the maxilla and mandible. Although first described in 1953, the first case of temporal bone GCRG was reported by Hirschl and Katz in 1974 following which similar cases have been reported in other sites such as orbit, paranasal sinuses, cranial vault, sphenoid and ethmoid bones. These lesion are locally aggressive and should be distinguished from a Giant cell tumor which has a higher chance of recurrence. 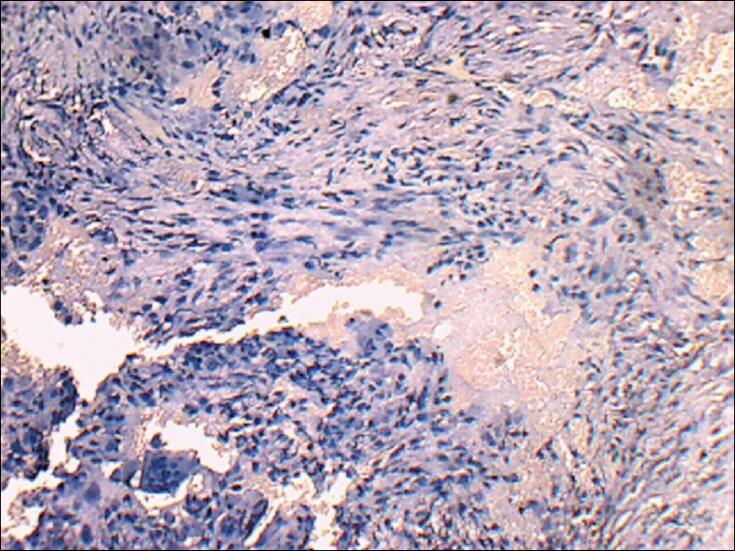 We report a case of a 38-year-old female patient with a GCRG of temporal bone. The present case report is about a 38-year-old female patient who presented with a 3 month history of swelling in front of the right ear. The swelling was associated with intermittent dull aching pain. There was no associated hearing loss, facial weakness and no history of preceding trauma. 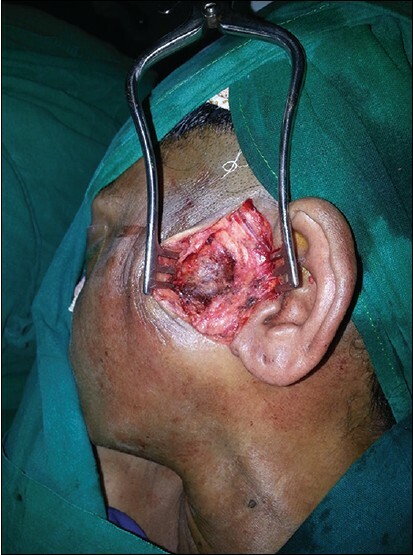 Clinical examination revealed a 3 × 3 cm solitary, smooth, non-tender swelling in the left pre-auricular area extending inferiorly from the left tragus, to involve the squamous temporal bone superiorly and anteriorly 3 cm in front of the left helix. Fine-needle aspiration cytology of the swelling was inconclusive. Computed tomography scan revealed a bony, expansile lesion with soft tissue involvement along the squamous temporal bone extending from the skull base superiorly to the masticator space inferiorly, with minimal uptake of contrast. The patient underwent a surgical curettage of the lesion [Figure 1]. A 3 cm × 3 cm solitary, cystic lesion was found deep to the temporalis muscle. The lesion was dark red in colour, soft in consistency and vascular with surrounding bony destruction exposing the intact duramater deep to the squamous temporal bone [Figure 2]. Histopathological examination showed predominantly bland, fibroblast like spindle cells and multinucleated giant cells with phagocytosed iron and red cells seen amidst the spindle cells. Extensive areas of hemorrhage and osteoid was also present [Figure 3], suggestive of GCRG. Histologically these lesions consists of a number of multinucleated giant cells in clusters within a stroma of fibroblastic cells. In addition, GCRG may also contain foci of osteoid substances, hemorrhage and hemosiderin deposits. 1. Yu JL, Qu LM, Wang J, Huang HY. 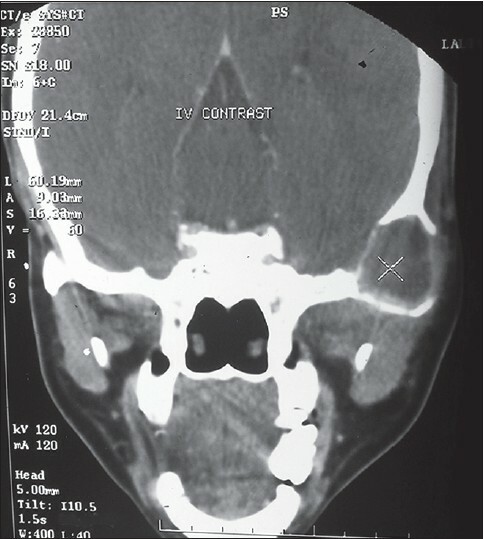 Giant cell reparative granuloma in the temporal bone of the skull base: Report of two cases. Skull Base 2010;20:443-8. 2. Williams JC, Thorell WE, Treves JS, Fidler ME, Moore GF, Leibrock LG. Giant cell reparative granuloma of the petrous temporal bone: A case report and literature review. Skull Base Surg 2000;10:89-93. 3. Kim HJ, Lee HK, Suh DC, Choi CG, Kim JK, Lee JH, et al. Giant cell reparative granuloma of the temporal bone: MR findings with pathologic correlation. AJNR Am J Neuroradiol 2003;24:1136-8. 4. Reis C, Lopes JM, Carneiro E, Vilarinho A, Portugal R, Duarte F, et al. Temporal giant cell reparative granuloma: A reappraisal of pathology and imaging features. AJNR Am J Neuroradiol 2006;27:1660-2.